It is a hot an muggy day here at the end of South Africa’s summer. We have lovely hard rains nearly every 24 hours — usually at night. This beautiful old neighborhood of Melville is filled with flowering trees and shrubs and interesting homes all behind heavy walls and gates. Each house has a security sign and often dogs. Men are posted around the neighborhood to keep watch. But the feeling is one of serenity and I feel very safe wandering around exploring the streets. Last night we attended the Dance Umbrella fundraising gala and performance at the Market Theatre where most events have been taking place. This is a wonderful old building with a grand foyer, and a bar and restaurant that serve as the gathering place where audiences and artists mingle. The gala was much more modest than in 2010, due no doubt to the loss of their largest funder FNB. Director Georgina Thomson and project manager David April hosted the event that was smattered with videos and live performances excerpts. All the dancers were spectacular but my favoritel was an excerpt from Gregory Maqoma’s piece “Skeleton Dry”. 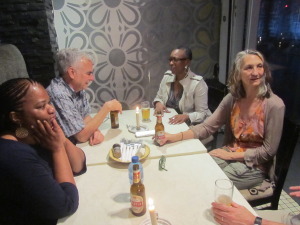 We were eager to lend a hand and talk with current and potential sponsors about the importance of DU in the ecology of Southern African dance but sadly none of the staff seemed available to introduce us to their sponsors. with Boyzie Cekwana, Neli Xaba and Mamela Nyamza. Nothing takes the place of just getting to hang out with these amazing artists and learn more from them about their lives, their work and conditions on the ground. We are very much looking forward to our two days of meetings with them that begin tomorrow. It has been such a gift to have had major support of the Doris Duke Foundation, NEA and now Robert Sterling Clark to convene, learn, exchange and develop partnerships.